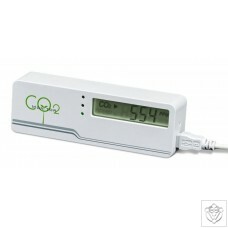 The Mini CO2 Monitor is a low-cost, compact and easy-to-use mini carbon dioxide and temperature meter. The CO2mini is easy to use: just plug it in to a PC or any USB port with the included cable and it will begin to measure air quality instantly. It has no moving parts, and is designed to last for years. Three LEDs - green, yellow and red - show overall air quality instantly, or you can read the CO2 and temperature levels on the large display.Specifications: CO2 Measurement Range: 0-3, 000ppm Response Time: < 2 Minutes Accuracy: 0-2, 000ppm 100ppm or 7% of reading Temperature Range: 0C to 50C (32F to 122F) Temperature Display: C or F Switchable Sensor Life Expectancy: 15 years.